The better airflow inside your system, the cooler and more stable system you will be. 24.2 CFM Higher airflow to enhance cooling performance. Silent operation at 20 dB-A for excellent case cooling. We do our best to taken pictures so your know what you are buying. 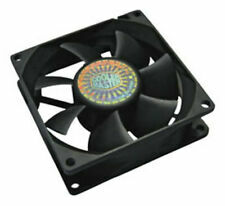 New Cooler Master 8 0mm x 25mm server grade long life 12V DC fan with 2 ball bearings in color black (model # SAF-B82-E1 ). Also included are a 3 pin to 4 pin molex adapter and 4 fan screws. Bearing: Dual Ball. Cooler Master R4-S8R-20AK-GP ST2 Rifle Bearing 80mm PC Computer Case Fan. Condition is New. Shipped with USPS First Class Package. Bearing Type Rifle. ‣ Keyboard / Mouse. The better airflow inside your system, the cooler and more stable system you will get. - Strong air flow to enhance cooling performance. Fan Noise Level (dB-A) 20.9 dBA. 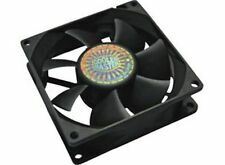 Cooler Master FA08025M12LPA Mute CPU cooling fan 12V 0.45A 80 80 25MM 4wire PWM. Model: FA08025M12LPA. Interface: motherboard 4Pin, PWM, support speed. Size: 80 80 25MM. B rand; Cooler Master. Without any screws,only fan. Cooler Master Rifle Bearing 80mm Silent Cooling Fan for Computer Cases and CPU Coolers. 80x80x25 mm, ~ 2000 RPM speed, ~28.9 CFM air flow, 20.9 dBA noise level, 50000 hr life, Rifle. Bearing, ~ 2.2 mmH2O air pressure, 3 pin connector with one 3 to 4 pin Adapter. Cooler Master Standard Fan 80ST2. Fan Life Expectancy 50,000 hours. Fan Noise Level (dB-A) 20.9 dBA. Connector 3 pin / 3 to 4 pin Adapter included. Speed 2000 R.P.M. ± 10%. Color Black. Current (Ampere) 0.10A. I do have one dog and one cat. •24.2 CFM Higher airflow to enhance cooling performance. 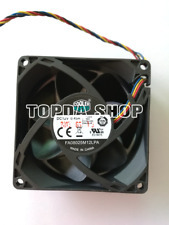 Fan Noise Level (dB-A) Fan Life Expectancy 3 to 4 pin Adapter •Silent operation at 20 dB-A for excellent case cooling. 1.43 mmH2O. Air pressure (mmH2O). We take pride in our highly qualified crew with vast knowledge and experience with computers & electronics. Fan Life Expectancy 30,000 hrs. Bearing Type Long Life Sleeve. Noise 19 dBA. Condition is New. All photos are of actual item. Cooler Master Desktop Case Fan. Genuine Cooler Master Case Fan. Cooler master model: A8025-21CB-3BN-P1. 3 pin connection. Cooler Master R4-S8R-20AK-GP Rifle Bearing 80mm Silent Cooling Fan 3.1"x3.1"x1"
Manufacturer: Cooler Master Co., Ltd. Product Type: Cooling Fan. 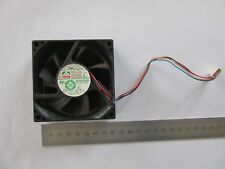 R4-S8R-20AK-GP Cooling Fan. 1 x 3-pin to 4-pin Adapter. Fan Information. Fan Speed: 2000 rpm. RMA numbers will not be extended or reissued. Five Cooler Master 80mm fans A8015-20CB-3BN-F1. Brand new. Arrow on side denotes direction of airflow. PLEASE READ THE FOLLOWING BEFORE MAKING A BID Payment must be made by PayPal within 48 hours of the end of the auction. This ensures prompt despatch of your item. Due to issues in the past with nonpaying bidders, all nonpaying winning bidders will now be reported to eBay without exception. Due to the high cost of Royal Mail postage prices, all items will now be sent by myHermes couriers which is a tracked service. If you live in a remote area, please contact me for the correct postage cost for your area before making payment. Thank you! 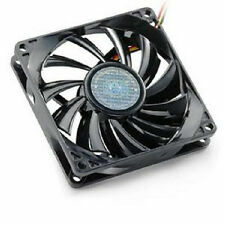 Cooler Master Blue LED 80mm x 25mm 3Pin Case Fan. There are only 4 MARs in the United Kingdom. Item has been pulled from salvage machine so expect the item to be in a used condition with minor scuffs etc. Cooler Master AMD Processor Heatsink & Fan for Athlon XP, Duron, Pentium & Celeron 3 (see photo's). ASUS Socket 775 Motherboard P5KPL-AM SE REV. 2.01G. Photo is a representation only and may not be of actual item. AOpen Socket 478 MicroATX Motherboard MX46-533V. Kyocera FS-3040MFP Multifunction Laser Printer 90% Toner FS-3040MFP . 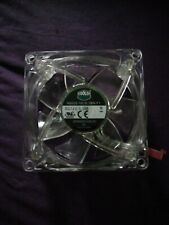 Protechnic Magic Cooler Master 80mm / 90mm Round Fan- TESTED. Picture of Actual Part You Will Receive. Sorry for the inconvenience. In excellent condition. 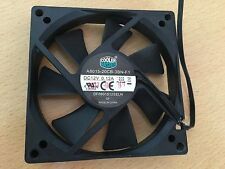 Cooler Master 3Pin Cooling Fan 80mm x 25mm. Item has been pulled from salvage machine so expect the item to be in a used condition with minor scuffs etc. Helpful Links. There are only 4 MARs in the United Kingdom. P/N: BP802512M. Cooler Master Case Fan 80mm x 25mm. Item has been pulled from salvage machine so expect the item to be in a used condition with minor scuffs etc. There are only 4 MARs in the United Kingdom. P/N: MGT8012MS. 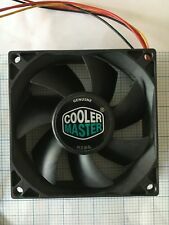 Cooler Master Case Cooling Fan 80mm x 25mm. Item has been pulled from salvage machine so expect the item to be in a used condition with minor scuffs etc. There are only 4 MARs in the United Kingdom. Coolermaster A8025-25AB-3BN-P1 [31cm 2510]. Connector3-Pin type 2510. Cable Length31cm. Cooler Master Rifle Bearing 80mm Silent Cooling Fan for Computer Cases and CPU Coolers. Silent operation for case cooling. The better airflow inside your system, the cooler and more stable system you will get. The better airflow inside your systemthe cooler and more stable system you will get. - 24.2 CFM Higher airflow to enhance cooling performance. Make sure this fits by entering your model number. - Silent operation at 20 dB-A for excellent case cooling. Cooler Master Model TF-251M-74 12v DC P/No. This fan is in clean working condition. 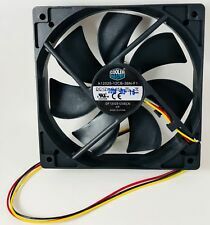 Original 80mm case fan for the ELITE 120, can also used in CM 690 / 590 / 690 II etc. Fan Noise Level (dB-A) 20 dB-A.